Petroleum is on the rise again and this week IHS said that refined product demand growth has averaged 1.2 million barrels per day over the last five years and that global total liquids oil demand growth is at similar levels to what was recorded during the 2003 to 2007 commodity super-cycle, referred to as the ‘golden age‘ of refining. At the same time, US gasoline prices are at a three-year high, says CNBC. This time, the response has been to dither on biofuels and to point to reasonably dismal sales of EVs as evidence that an electrics solution is on the horizon. 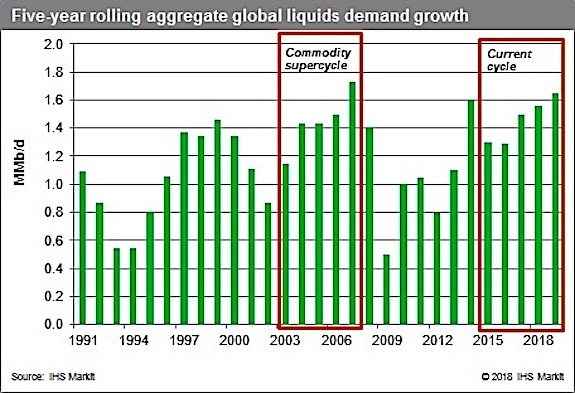 In Texas, IHS Markit reports that current global total liquids oil demand is approximately 100 million barrels per day, expects global GDP to grow by 3.4 percent in both 2018 and 2019, respectively, due to convergence of robust economic activity in many markets around the world. The power once held by a coalition of interests that once propelled first-generation biofuels to their current usage levels has crumbled in so many ways. Though there have been significant challenges to the expansion of first-gen biofuels in recent years — now, we are seeing evidence of real fall-back in mandate levels. Groups of first-gen producers are responding via co-ordinated analyses and declarations to rally their supporters, technological innovation to reach deeper into advanced biofuels. Let’s have a look at the US and Europe. In Washington, the Renewable Fuels Association, in a recent analysis which can be found here, found that EPA’s recent actions in exempting small refineries from their Renewable Fuel Standard blending obligations for 2016 and 2017 have effectively lowered the volumetric obligations by at least 1.6 billion gallons, according to an analysis of the agency’s own monthly compliance data by the Renewable Fuels Association. The volume of lost blending obligations for these two years is 10 times the collective volume of lost volume from 2013-2015. In recent weeks, it’s been widely reported that EPA has exempted as many as 25-30 small refineries from their RFS blending obligations in 2017, and as many as 20 refineries from their 2016 obligations. EPA has not disclosed the exact number of exemptions granted or the volume of required renewable fuel blending that was effectively erased, despite numerous requests from industry stakeholders. Meanwhile, in Europe, the European Parliament voted in favor of the RED II (Renewable Energy Directive) proposal in January. Probably the most notable (or at least covered in the news the most) was their decision to remove biodiesel made from palm oil from its list of biofuels that can count towards the EU’s renewables target from 2021. But more may be on the way — a complete phase-out of ethanol made from conventional crops. Examples abound of US ethanol producers adding small amounts of cellulosic ethanol production. The latest is from Ace Ethanol which will be the first ethanol plant to integrate the patented D3MAX technology with its existing corn dry mill. Ace Ethanol has received approval from its board of directors and members to proceed with the design and construction of the corn kernel fiber-to-ethanol plant. The D3MAX process employs patented, state-of-the-art technology to convert both five- and six-carbon sugars in wet cake to cellulosic ethanol. Starch, cellulose, xylose and arabinose are all converted to cellulosic ethanol with higher yields, lower energy consumption, and lower capital cost per gallon than other cellulosic ethanol producers. D3MAX also allows you to increase your corn grind by 20% or more, and increase corn oil recovery by 50%. According to Ace, the D3MAX process is the only corn kernel fiber-to-ethanol process that will not require an independent engineer to validate the cellulosic ethanol production every 500,000 gallons of cellulosic ethanol produced. With the D3MAX process, cellulosic ethanol gallons can be measured directly avoiding the cost of re-certification required by EPA for in-situ corn kernel fiber processes and processes that mix corn starch or sugar with the cellulosic sugars. Currently, all other corn kernel fiber technologies require costly re-certification every 500,000 gallons. Based on the results of pilot testing, Ace and D3MAX selected DSM to supply enzymes for the D3MAX process, and Lallemand Biofuels & Distilled Spirits has been selected to supply the yeast. Selection of the companies who will work together to build the first D3MAX plant marks another major milestone for D3MAX on its path to commercialization. More on D3MAX is here. In Europe, the strategy has been more around accepting the demise of palm oil and focusing on joint political action to oppose any declines in ethanol production volumes. “Long term sustainable solution in line with market realities” – is the message from the Visegrad 4+3 group representing the biofuel industry in seven Central European countries in a joint declaration to the RED 2 Directive trilogue process published today. The group represents biofuel associations and 31 biofuel companies from Poland, Czech Republic, Hungary, Slovakia, Lithuania, Latvia and Bulgaria. The joint declaration calls on policy makers to ensure the use of proven crop based biofuels is not reduced or capped and to set a minimum 12% level of actual (not multiple counted) renewables in transport by 2030. It advocates reasonable policy support for advanced biofuels. It adds that multiple counting supports fossil fuel, increases oil’s market share in transport, leads to higher GHG emissions and precludes private investments in renewables. “We propose reasonable and realistic phasing in of advanced biofuels, on the top of crop-based biofuels; taking cost, sustainability and viability criteria into account.” said Zuzana Jakubičková, Director of Legal Affairs, Slovakian Biofuels Association. We’ve been reporting on the significant expansion at World Energy through merger & acquisition. Now, biodiesel producer HERO BX, recently announced a strategic partnership with Iowa Renewable Energy to manufacture and market biodiesel from IRE’s Iowa facility in Washington, IA. Iowa Renewable Energy, founded in 2005, owns and operates a 30 million gallon biodiesel refinery. “Brexit is the impetus to reinvigorate”: The advanced bioeconomy, resilience and the new role for the Commonwealth?